Me pudgy little fingers have been spending long hours lately maneuvering faders and knobs, compressors and EQs, delay lines and patch cables, microphones and instruments of all kinds—not to mention ledgers, tax forms, and business correspondence. They haven’t, therefore and rather obviously, been visiting this space to tap out the activities and ponderings of the Red Sun Soundroom crew in many a month. September gave us a spectacular Listening Salon, and the transcribed playlist—here come the promises!—will be posted here in the very near future. There are several records that have been passing through the corridors of Red Sun that are in various stages of writing, production, or completion, including works by DeesKnees, Cavanaugh & Kavanaugh, Kelly Ballard, as well as the Red Sun Sample Series, and personal contributions by that Koniuto guy both to Negative Sound Institute and Intelligent Machinery. I also travelled to Boston recently to discuss some possible film work. In the meantime, i’ve been meaning to start this list since about 1993, back when i was working at White Crow Audio in Vermont and was introduced to two extraordinary individuals who would become mentors: Tom Walters (White Crow’s head engineer), and David Torn (who was at White Crow composing/recording/mixing the record, Polytown with Mick Karn, Terry Bozzio, and Bruce Calder). It may have even been TomWa’s idea: compile a list of non-audio-related items that every good recording studio needs. Things that have no bearing whatsoever in the nuts-and-bolts of audio production (so, not good monitors, not microphone wind screens, not acoustic treatment materials—these items go without saying) that, through experience, we have found to be vital to doing good work in the recording environment. So here’s the first installment, because the list may go on and on, and i’m quite likely to keep forgetting that thing. Every studio has their favorite brand and particular uses. 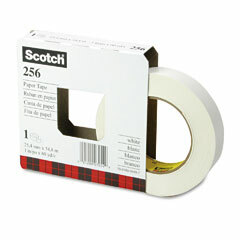 I would be completely lost in my shop without 3M’s Scotch brand 256 paper tape, 1-inch thickness. Uses include, but not limited to: labeling console channels and mic inputs, securing mics in mic clips, labeling outboard gear assignments, attaching lyric sheets to music stands and/or musical instruments, crafting instant play toys for pets or lead singers. I can’t think of a tool so critical to the well-being of all those involved in record-making. After a long day of takes, editing, punch-ins, signature DSP architecture, singing/playing/performing your heart out, deep listening, conflict resolution, and damn fine eating, who is ready at 2:00a to begin handwashing all those dishes? The coffee mugs alone have become a mountain. In my experience, give yourself the requisite 45 minutes to find all the dishes. (Hint: if the client has recently signed a record deal with a label of any size whatsoever and, hence, “made it”, look in the trash. What is disposable to a new rising star does not equal what is disposable to a bona fide business who happens to work with such clientele.) You will need that 45 minutes more often than you know. Use the next five minutes to load the machine and then get some sleep. You need white boards and markers and if you don’t have them now you have no idea how badly you need them. This keeps everyone on the same page. What is needed next on such-and-such song? How do you envision the flow of your album? If you want to lay down lead [whatever] next, in response to the lead vocal, we need first to comp the 6 fragmented takes into a strong lead vocal so the soloing instrument can respond to it. The recording studio is not a democracy. Some will argue that point with me, and that’s fine. But it isn’t. Most creative environments are not. Freedom of speech and opinion, however, must exist in this environment. Scribbling out your hopes and dreams and fears in an eraseable but visible format is key to this process: this is note-taking for the village. And it takes a village to birth and raise whatever happens in a recording studio. Talk about it, and document it. You have no idea when that bad idea, scratched down in purple, will turn into the solution everyone is looking for three weeks from now. …let us know you’re listening.